Buy marijuana seeds in the USA with free, guaranteed shipping to all states. With the middle of January quickly approaching, many people begin to buy marijuana seeds in USA, in preparation of the coming growing season. Spring will be upon many of the more southern states quickly, and having seeds ready to germinate and plant can save a lot of time. With a wide and varied selection of both feminized and auto flowering seeds, we offer some of the highest quality seeds and most popular strains available. With many states amending their laws over the growing and possession of both medical and recreational marijuana, more and more people are now able to cultivate their own plants. In states like California, all residents are now able to legally grow a limited number of marijuana plants for their own personal use, without breaking any state laws. Although limited to six plants, residents may now grow marijuana for personal use without the need for a medical licence or marijuana card, allowing people to cultivate plants for both recreational and medical use. With many people now beginning to grow for the first time, many are looking to buy marijuana seeds in USA online and have them safely delivered, totally free of charge. A potent strain with a high THC content, perfect for relaxing in the evening and socializing. Can help to reduce stress, ease depression and reduce chronic pain. Created by crossing an OG Kush with a Durban Poison, Girl Scout Cookies is a highly popular Californian strain that’s achieved legendary status. Very potent, generating a relaxing, euphoric high, recommended for recreational and medical users. Gorilla Glue marijuana seeds are a highly popular choice for both indoor and outdoor growers, and are one of the latest additions to our feminized seeds collection. Created from a blend of three strains, Chem’s Sister, Chocolate Diesel and Sour Dubb. Indoor or Outdoor Marijuana Seeds? We offer a wide and varied selection of marijuana seeds for sale, including a choice of feminized auto flowering seeds, perfect for planting outdoors from the beginning of early Spring. Almost all marijuana seeds, feminized and autoflowering, can be planted and cultivated both indoors and outside, although certain strains are known to grow better one way or the other. For example, many growers plant a combination of both traditional feminized, and auto flowering seeds during the early Spring months. Often Sativa dominate, these feminized seeds will grow throughout the early Summer months, before flowering during August, September and maturing in October, depending on the strain. For many growers these plants will provide enough high quality marijuana to last through the Winter and Spring months, until planting time comes round again. This is especially true for growers who plant Autoflowering seeds together with their traditional feminized varieties, as these plants will grow, flower and mature in under 70 days from sprouting. Autoflowering seeds contain a special Ruderalis gene that allows them to flower regardless of the number of light hours the plants receive. This special characteristic allows for auto flowering seeds to be planted in early Spring and enjoy the strong sun and long daylight hours of early Summer, while flowering and maturing without the need for the traditional 12 hours of uninterrupted darkness. In fact, autoflowering seeds produce their best and heaviest yields when subjected to 18 hours of strong, direct sunlight, making them a perfect choice to buy marijuana seeds in USA for planting outdoors as soon as Spring begins. These marijuana seeds will then produce a fast, high quality harvest, while your traditional feminized seeds are still growing in their vegetative stage. With autoflowering seeds maturing with age, 55 – 70 days from sprouting, depending on strain, many growers stagger their planting schedules to provide a constant, fresh supply from the end of Spring. Autoflowering seeds can be germinated and sprouted indoors before planting outside, speeding up the process by around 2 weeks. Stains such as Super Skunk Autoflowering require some of the shortest flowering times, with the plants fully flowered and mature within 2 months. Therefore germinating 3 high quality seeds per month would result in a fresh, regular supply every month, after the initial 2 months wait in early Spring, without growing more plants than legally permitted. In southern parts of California, 3 autoflowering seeds could be planted per month through until early August, providing a regular, high quality harvest every month from June through to October. Fruity, colorful buds make Blueberry marijuana a popular choice, and this autoflowering variety make growing even easier. A perfect choice to grow during the Summer months, flowering regardless of the number of light hours it receives. Speed, ease and quality combine in these autoflowering Super Skunk seeds, providing the quickest and easiest means of producing your own recreational and medical marijuana. The number #1 choice of ‘guerrilla growers’ across the USA. 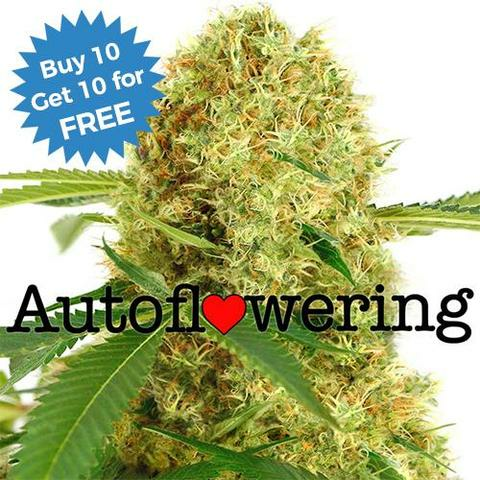 The most famous medical marijuana strain just got easier to grow with these White Widow autoflowering seeds. Great for beginners, requiring very little knowledge to produce a high quality crop, within twelve weeks from germination. Whether it’s feminized or autoflowering, you can buy marijuana seeds in USA online and enjoy the highest quality customer care and service. All our highly recommended cannabis and marijuana seeds are dispatched directly from I Love Growing Marijuana, one of the world’s leading suppliers of quality marijuana seeds, with postage and stealth packaging costs included in the price. With a wide choice of stable, high quality seeds, all purchases are 100% guaranteed to arrive, or replacements will be dispatched as soon as possible. Find all the help and advice you need with a complete library of articles covering all aspects of germination, growing and harvesting your own marijuana, with tips on improving both the quality and quantity from your plants, as well as a free, no obligation download, Growing Marijuana Guide available to all, from beginner to the more experienced grower. Enjoy a selection of secure payment methods, from Bitcoin to credit card, all totally secure and encrypted, with a first-class customer care department to answer any questions or concerns. With many years experience, and a world-wide reputation for supplying the finest, highest quality marijuana seeds, click below to buy marijuana seeds in USA today.